2019 Barnebirkie updates and additions! Caution! Birkie Fever is catching! Whether they come by truck, car, or plane, Hayward, WI will soon host skiers from around the world for the Greatest Show on SNOW-The American Birkebeiner. 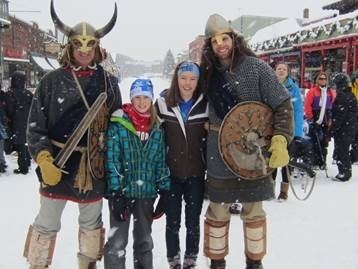 The 2019 Barnebirkie event will launch the festivities on Thursday, February 21st. The kids’ route will return to the golf course behind the Hayward Elementary Campus. Registration will occur at the big tent just off 5th Street, where skiers will pick up their bibs and hats. Participants in the Barnebirkie are between the ages of 3-13. The Barnebirkie has been long supported by the Sons of Norway 5th District. Each year our members provide cookies by the thousands to ski families at the Celebration Tent in downtown Hayward. Our volunteers also assist with the ski registration, serve a hot lunch to our volunteers, play music at the VFW canteen, assist the classic skiers at the Expo, and fulfill other requests made by the Birkie Office. You will recall that our District was awarded the 2018 Shellie Milford Spirit of the Birkie Award for our unwavering support. 2019 will be no exception, and due to the loss of some workers we are needed in earnest! The District 5 Board recently approved an incentive to Lodges for their baking efforts. Lodges are asked to gather their members for a Baking Day which will benefit the Birkie event. Take pictures of your efforts for posting on the District 5 website or on the D5 Facebook page. The Lodge that sends the most cookies to the event will be awarded a $50.00 prize. In order to determine the winning lodge, it will be necessary for your lodge to label the boxes you send with the number of dozen per box OR your lodge’s president can send a tally sheet indicating the number of cookies (dozens) donated. A clipboard will be available in the cookie tent for any lodges delivering cookies to the tent that day. One objective of the Baking Day is to create fellowship among your members, and it would be a great activity to welcome any new members into your fold. Lodges can incorporate specialized Norsk varieties of cookies that your lodge could later use at another event. This activity would also help your lodge to meet, in part, the Mission of the Sons of Norway, of promoting and preserving the heritage and culture of Norway. By doing so, your members would additionally earn credit toward a cultural pin! For more information on that pursuit, go to SofN.com: Select Cultural Programming and choose Cultural Skills. Traditional Norwegian Cooking requirements will be outlined. You will find the requirement for Baking and Desserts listed. Download the paperwork needed for this exercise, and you are on your way. Lykke til! CAUTION-Due to the many individuals who have been diagnosed with allergies to tree nuts and peanuts, please DO NOT use them in your baking. The classic skiers have also made a request for healthy cookies! Providing a spice cookie such as cardamom, molasses, ginger, pumpkin, or a fruit option would be fantastic. Oatmeal raisin cookies are popular, too. *Additionally, some lodges choose to purchase cookies made in a controlled environment which is free from allergens. After discussion at the Board level, all cookies contributed will be entered into the prize contest. Lodges that wish to send a support check for this event, should make it payable to the Sons of Norway-Fifth District. Mail it directly to the District 5 Treasurer, Michael Palecek: 5747 Sandy Lane, Racine, WI 53406. Indicate on the memo line of your check, Barnebirkie, so your lodge can also receive recognition. If you would like to help us at the Barnebirkie in Hayward, WI, please select your area of interest from the options listed below. Send your interest to District 5 Sport and Recreation Director, Cheryl Wille-Schlesser: rogrcher@mhtc.net, or contact me by phone: 608-219-4464. I will begin organizing a service record for this event. 6) Other area of service, please indicate. An organizational meeting will be held on Wednesday evening, February 20th, at 6 PM. When the destination has been secured, an e-mail will be sent. The meal cost is your responsibility. Any special announcements will be made, job assignments will be announced, and nametags will be distributed. Please try to attend, if you are in town on Wednesday evening. *Make your reservations for lodging now, as rooms are often limited! District 5 earned the Shellie Milford Spirit of the Birkie Award for over 30 years of service to the Foundation. Members from many District 5 Lodges assist with this worthy event each year. Their jobs include: baking thousands of cookies, registering children for the Barnebirke ski event, serving cookies to young skiers and their families, and helping to move materials across Hayward as needed. In addition, other members meet and greet classic skiers at the Expo Center, and they distribute Sons of Norway materials. Cookies are donated to guests, but being frugal Norwegians, there is a charge for a good cup of coffee! Other members are involved in planning and preparing a luncheon for Birke volunteers and for the Ski Patrol staff. We are proud to represent District 5 and the Sons of Norway each year as the Nordic lifestyle is celebrated in the Midwest. The American Birkebeiner has had participants from 49 states and 36 countries over the course of its operation.